In California, the mid-1990s were an era of poisonous immigrant-bashing and stepped-up workplace raids. Many immigrants felt abandoned by government, and by most social and political institutions as well. Where I come from, the two exceptions were the Catholic Church and organized labor. When the history of our times in Los Angeles is written, one of the proudest chapters will record how the LA labor movement, led by my predecessor and late husband, Miguel Contreras, and the cardinal archbishop of Los Angeles, Roger Mahony, steadfastly championed immigrants and workers, and unequivocally stood against prejudice and fear. Starting with the opposition to Proposition 187, the anti-immigrant initiative pushed by Republican Governor Pete Wilson in 1994, the LA labor movement and the struggle for immigrant rights became inextricably linked. We in the LA labor movement led American unions in standing up for the rights of immigrant workers, and labor across the United States took up the cause. Just as important, since the mid-’90s we in LA labor worked with our local unions in mobilizing Latinos to vote and unleashing the enormous potential of their participation in civic and political life. We taught immigrant housekeepers, janitors and homecare workers—and now sanitation and car wash workers—to take part in civic affairs and election campaigns. In Los Angeles, they have elected mayors, City Council members, county supervisors, legislators, speakers of the State Assembly and governors. In 2010, when Tea Partiers swept the nation, they were stopped at the California border: we elected Jerry Brown governor, re-elected Senator Barbara Boxer and put Democrats in every statewide office. A key factor in those victories was the Latino vote. We experienced our own Wisconsin-style anti-union attack last year in California, when ultra-rich ideologues placed Proposition 32, aimed at destroying labor’s ability to lobby and campaign politically, on the November ballot. But we defeated Prop 32 and passed Proposition 30, raising taxes on the wealthiest Californians. At the same time, the Los Angeles County Federation of Labor and UNITE HERE together turned out the vote for a successful hotel workers’ minimum-wage proposal in Long Beach. Today, on the national stage, immigration reform is the potential game changer for American labor. But as much as we must battle for it with every fiber of our being, immigration reform is not a panacea: we could win on it and still see private sector union membership fall further. 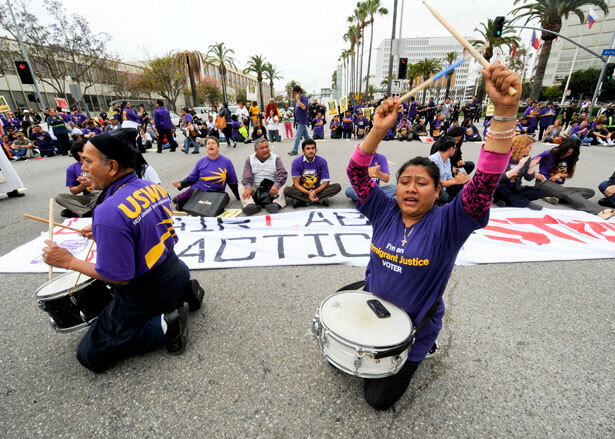 Here in Los Angeles, unions have successfully organized mostly immigrant janitors and hotel, sanitation and car wash workers. The only way immigration reform will change the game for labor nationally is if labor aggressively organizes immigrants—and switches from defense to offense. Maria Elena DurazoMaria Elena Durazo is the executive secretary-treasurer of the Los Angeles County Federation of Labor and chair of the national AFL-CIO executive council’s Immigration Committee.